Cruel transport practices and the misery they cause are driven by economics and fueled by a lack of government oversight. Animals pay the price in pain and suffering to provide cheap meat to consumers and to increase meat industry profits. 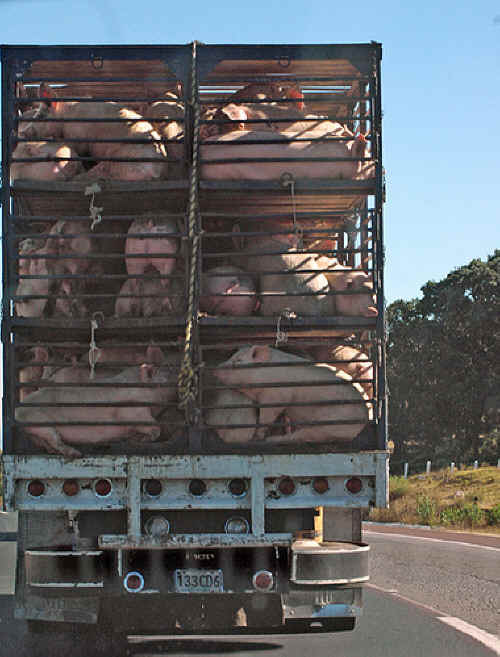 You have likely seen them on the road or highway — large trucks carrying a cargo of live farmed animals. You may have caught a glimpse of the animals held inside — a nose poking through, an eye peering out. You may even have wondered, just for a moment, about these animals — where are they coming from, where are they going, and what are they feeling? But you likely never imagined that the animals were headed to a far-off state, traveling for hours or days on end without food, water, or rest. You probably didn't picture many of the animals becoming sick or injured or even dying on the way to their final destination. Yet, that is the grim reality for millions of farmed animals raised as food each year in the United States.